The eminent scientist who ushered India into the atomic age was Dr. Homi Jehangir Bhabha. He was born on 30 October 1909 in a Parsi family of Mumbai. He is called the 'Father of Indian Nuclear Science'. 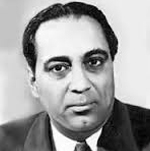 Dr.Bhabha was appointed the first chairman of the Atomic Energy Commission, set up in 1948. It was largely due to his efforts that the nation's first Atomic research Center, now named Bhabha Atomic research Center, was established at Trombay, near Mumbai. Under his expert guidance the nation's first atomic reactor 'Apsara' was also commissioned in 1956. In 1945, he founded the Tata Institute of Fundamental Research in Mumbai. Dr.Bhabha had a highly distinguished career and was an exceptionally bright student. Even as a student, he made some fundamental discoveries in electricity, magnetism, quantum theory and the cosmic rays. Dr.Bhabha as the scientist of a very high caliber, received many national and international awards and honours. In 1942, he was awarded the 'Adams' award. In 1951, Bhabha was elected the president of the Indian Science Congress. In 1955, he was elected the chairman of the U.N. sponsored International conference on the peaceful uses of the atomic energy held in Geneva. The Government of India also honoured him with 'Padma Bhushan' in 1954. The 'Homi Jehangir Bhabha Award' has been instituted by Indian National Science Academy. He passed away in 1966 in a plane crash.